This is another of those hostas that has had several different names over the decades. It was ultimately registered as 'Subcrocea' by The American Hosta Society in 1987. It is supposed to form a medium size (14 inches high) mound of wavy, golden foliage but, according to The Hostapedia by Mark Zilis (2009), "The color varies according to the amount of light that it receives. I have seen it almost white-gold in sunny areas and chartreuse when grown in deep shade." This cultivar bears pale purple flowers in August. Zilis also states, "It has been a fairly popular plant for hybridizing, but nearly all of the seedlings share its one negative: poor foliar substance. Extra protection from slugs and dry conditions is an absolute necessity...No collection would be complete without this plant. 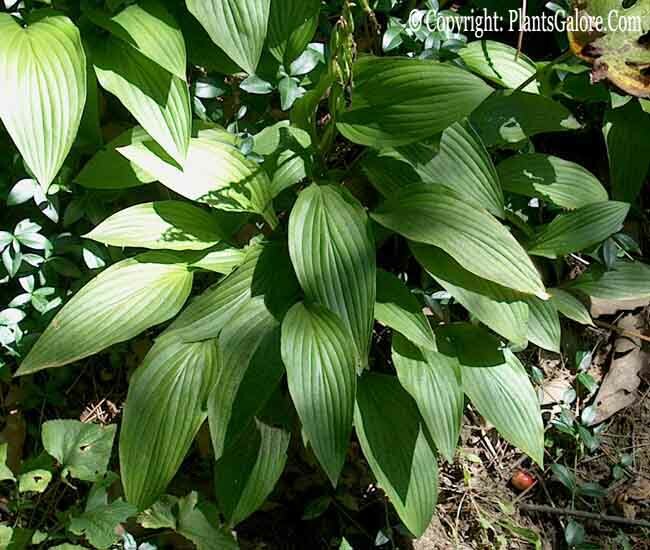 As I observe hostas, I often use 'Subcrocea' as a standard for comparison purposes."